'Just tell me who gave you the money and how much. I won't tell anyone that you told me,' the policemen tells the young lady voter. 'You think they give their name and address when they give you money?' she replies. A Ganesh Nadar records his impressions from Thursday's by-election in R K Nagar, Chennai. January 2009 when a by-election took place in Thirumangalam, it gave the expression 'Thirumangalam formula' to Tamil Nadu's voters. The Dravida Munnetra Kazagham was in power then and the architect of that formula was DMK patriarch M Karunanidhi's formidable elder son M K Alagiri. 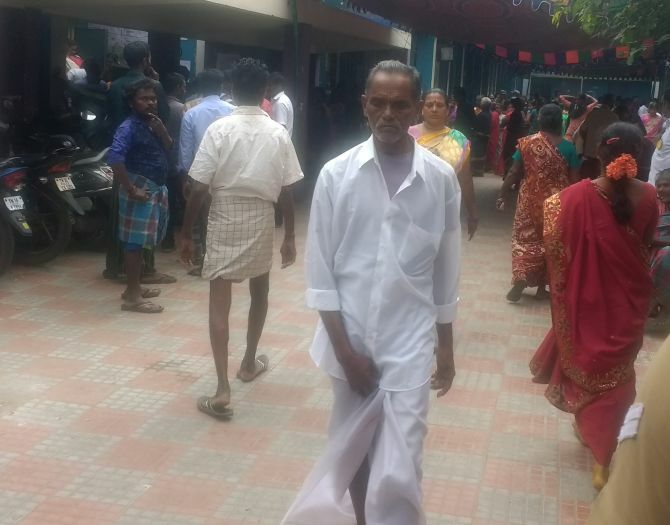 Voters were reportedly persuaded financially to vote the DMK's way, resulting in a landslide victory. Nine years later, in December 2017, we have another election as remarkable as the one in Thirumangalam, this time in Chennai city. The by-election in Dr Radhakrishnan Nagar -- or simply R K Nagar -- was necessitated by the sitting MLA's death on December 5, 2016. The MLA was also Tamil Nadu's then chief minister. Usually, DMK and All India Anna DMK cadres try to outdo each other in luring voters to their respective sides. This by-election, the DMK is nowhere in the race. The competition for voters' attention is between the official AIADMK nominee and the rebel party nominee. 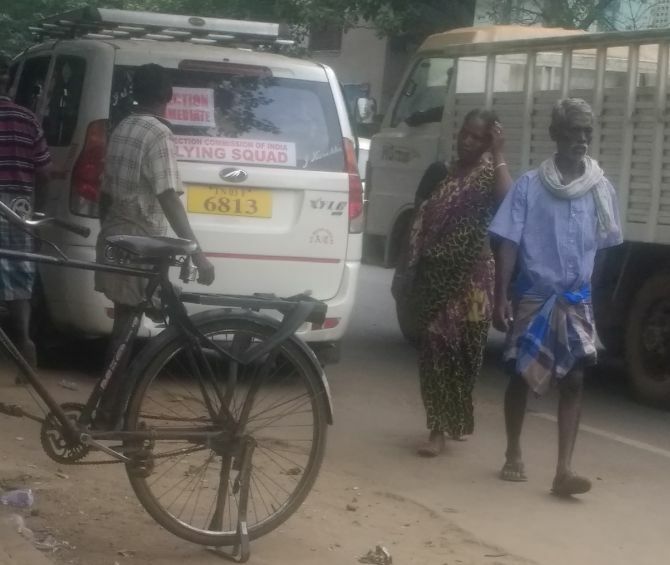 In a curious turn of events, the rebel candidate in the April by-election in R K Nagar -- which was countermanded because the Election Commission discovered cash freely flowing to voters -- is now the official party candidate in the December 21 by-poll. The official AIADMK candidate in the April by-election, subsequently expelled from the party, is now the rebel nominee. 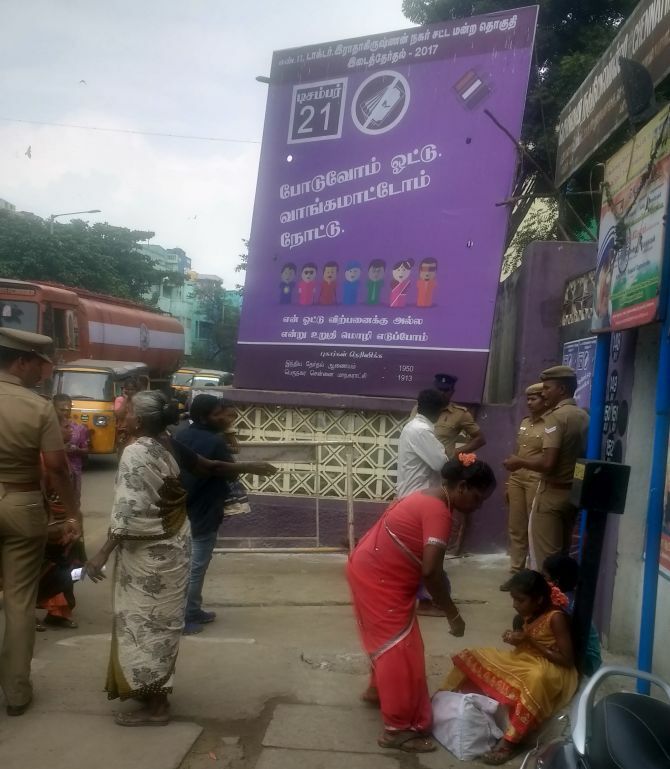 Polling day sees crowded polling booths and hordes of policemen -- both from the ranks of the Tamil Nadu police and the Central Reserve Police Force -- keeping an eye on the proceedings. "I have been awake since 4 am," Madhan, a DMK booth volunteer, tells me. "We had to go door to door reminding people to come out and vote." "We didn't distribute money. Who has money? We are not the ruling party," he says rubbing his sleepy eyes. "Committed DMK voters will vote only for us." The policemen on duty shoo away anyone lurking within 200 metres of a polling booth. One lady voter is unamused by the police alacrity. "My neighbour is still voting, I am waiting for her, what is your problem?" she tells the inspector in charge who is clearly unimpressed. "You think I am here to rob someone? How is my standing here affecting you?" she demands to know. "You cannot stand within 200 metres of the polling booth, now move and wait beyond that line," the police officer orders her. "Don't know what they think of themselves," the lady mutters even as she moves away shooting the police inspector an angry look. I overhear another policeman coaxing a young lady to spill the beans on which candidate has given her money. "I know you all got money to vote," the policemen tells the young voter. "Just tell me who gave you the money and how much. I won't tell anyone that you told me." "You think they give their name and address when they give you money?" the millenial fires back. Women in this constituency clearly don't seem scared of the cops. A fisherman stands desolate on the street. "Why haven't you voted yet?" asks another man who looks equally poor. "I didn't get the money last night. When are you giving it?" "I can give it only when it comes," the second man says defensively, "Last night what came, I have already given and you know that." "Then I will wait," the first man says adamantly. "You really think someone will come and give you money in the middle of the road?" "What do you mean? You want me to go home? OK! then say that," the fisherman says as he walks away. IMAGE: An election flying squad car parked on the street, waiting to pounce on any foul play. At around 2 pm, booth agents take stock of how many people have not voted and send their volunteers to their homes to fetch them. Some come willingly; others will need to be persuaded. The booth agents are used to this tactic. On the pavement the booth agents distribute voting slips. At around 1 pm they start handing out food packets to party workers who have toiled tirelessly since the early morning. "The liquor shops will open after 5 pm, you better not vanish before that," one party worthy tells another. "I won't go anywhere. I need a drink," the other replies. An election flying squad car is parked on the road. The officer in charge is chatting to someone he obviously knows and likes. The half-a-dozen cops in the car with him look bored. "The problem with seizing money at such a time is that we have to hand it over to the Election Commission along with a lengthy statement," one cop tells another. "Taking it to our police station is so much easier."